Comfort food doesn’t have to just be for the colder months. 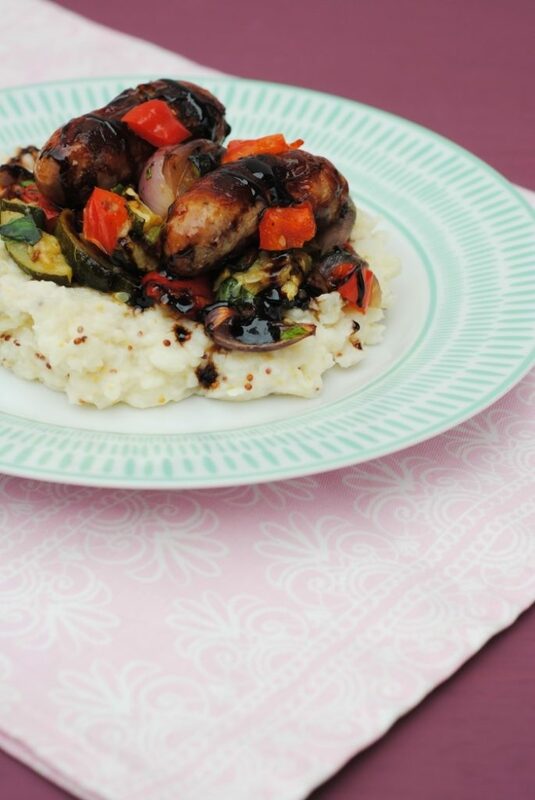 These Balsamic Glazed Sausages sit on a bed of roasted Mediterranean vegetables and could be served on mashed potato, spaghetti or even a salad for a light summer meal. 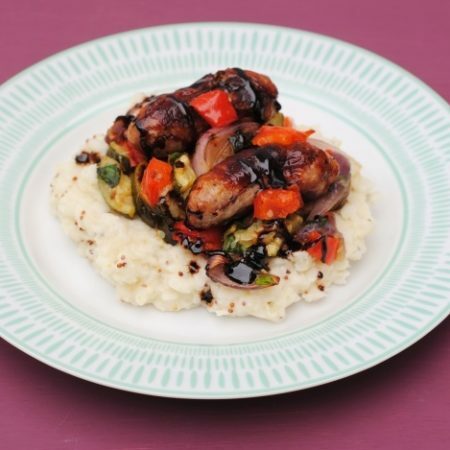 Balsamic Sticky SausagesBalsamic vinegar is one of those ingredients that I would take to a dessert island with me if I could only take 5 ingredients – don’t ask me to choose the other 4 though, as it’s too early on a Monday morning to make those kinds of tough life decisions. A little bit of balsamic goes a long way, and there is so much that you can do with it. We have been enjoying turning it in to a sticky glaze, like in this recipe. 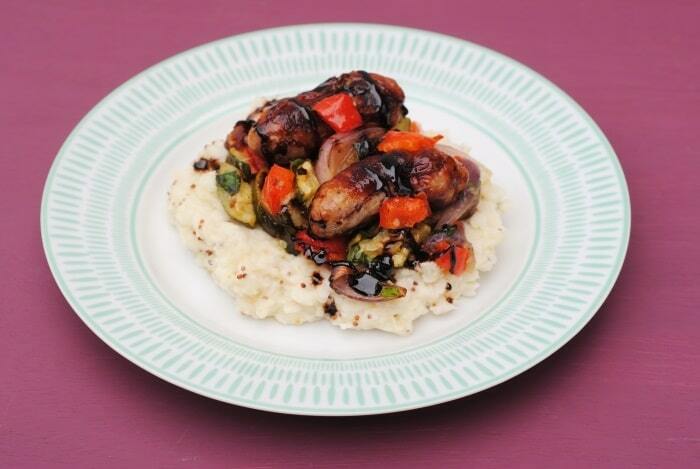 Do you want to be kept up to date on delicious and healthy recipes like these Balsamic Glazed Sausages? Please subscribe to the blog mailing list (it takes 30 seconds). You will get the new recipes sent straight to your inbox. Your email address won’t be passed on to anyone and you will never be spammed. Click here to sign up. Happy Monday again every one! This is a bit of a special Monday for us here in the UK as we are having a bit of a mini heatwave. Yes, there is sunshine, there is warmth and there is NO rain. I repeat….NO rain! I know that is just an average summer day for the rest of you around the world, but that is cause for celebration here in the UK. Did you all have a good weekend? We picked up a few more baby bits as we found a big sale on and I did some not so exciting, but boringly practical maternity shopping and we feel like we are actually prepared – for this stage anyway. Baby just needs some furniture in the nursery now, as hats are just not enough to live in. We haven’t quite broken out the BBQ yet (it came out in May when we had some sun, but they quickly went back in the shed again during the washout that was June), but we have managed to eat outside a couple of times over the past few days. Sitting in our flourishing *cough – overgrown* garden with a 0% alcohol beer and a plate of this was a little bit of a treat. The vegetables are roasted until they are nice and sweet and then the sticky balsamic glaze drizzled on top just makes it even sweeter. This main dish is so sweet, that you don’t even need dessert. Who am I kidding? We had dessert. The sweetness didn’t stop there though, as we topped this dish with our favourite Peppadew Hot Piquante Peppers. Whilst you might know these little bites of deliciousness as something you would just eat out of the jar, or put on a party food table, there is so much more that you can do with them. Chop up the Piquante Peppers and add them to your favourite dishes to not only add a touch of sweetness, but a kick of spice too. You could even use the cheese stuffed ones to add some creaminess as well. You can buy them in Asda, Sainsburys, Morrisons, Co-Op, Ocado, Tesco, Waitrose, Whole Foods and Booths, so pick up a jar and start transforming your meals with them. 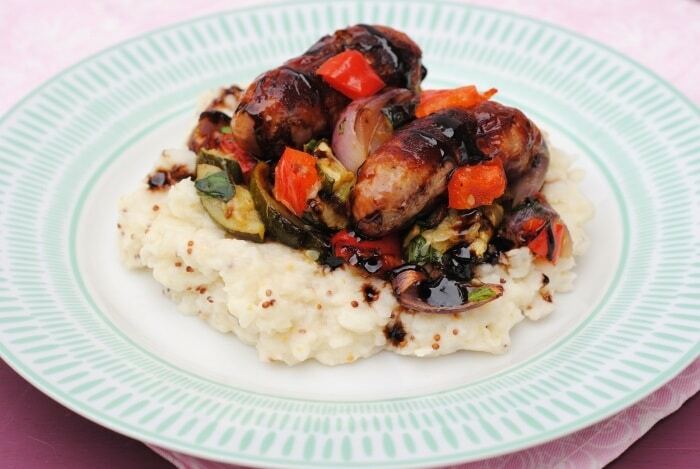 These Balsamic Glazed Sausages sit on a bed of roasted Mediterranean vegetables and could be served on mashed potato, spaghetti or even a salad for a light summer meal. Put the chopped vegetables and garlic in to a bowl with the olive oil and salt and pepper and mix well. Place them on a baking tray and add sausages to the tray too. Put in the oven for 35-40 minutes until the sausages are cooked through. When the sausages have been in the oven for 20 minutes, add the balsamic vinegar and caster sugar to a pot over a medium heat. Bring to the boil and reduce to a summer and cook for 3-4 minutes more until it turns in to a sticky glaze, and set aside until serving. Take the vegetables out of the oven and separate the onion and chop the red pepper in to chunks. Put the vegetables in to a bowl and mix through the fresh chopped basil. 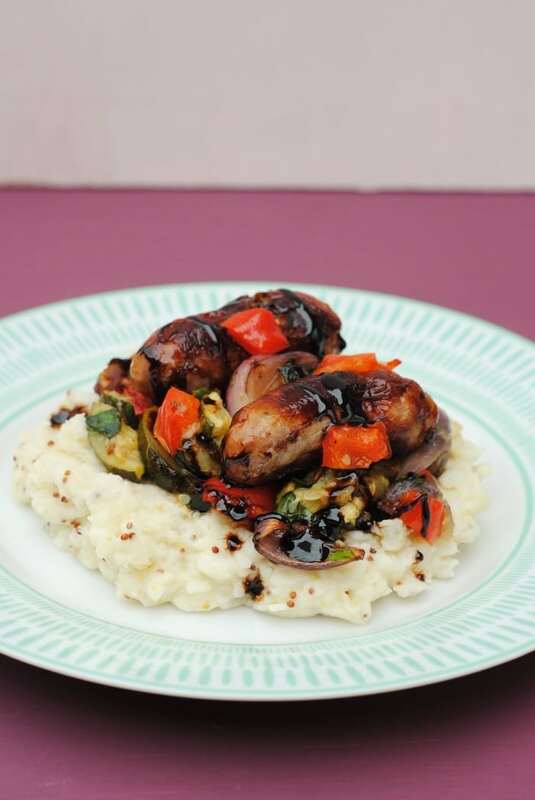 Finally, serve the vegetables and sausages on top of mashed potato, add the chopped Peppadew Piquante Peppers and drizzle over the balsamic glaze. I need to get these into my next supermarket shop ASAP! You can’t beat a good snag! I lovee balsamic vinegar, peppadew AND sausages but have tried all three together so will have to try this one out myself! I absolutely love sticky sausages – I made something similar myself this week! These look so yummy. This is going to come out terribly ‘Carry on…’ film but I do love a sticky sausage!!! This recipe looks absolutely amazing! I love sausages and this glaze sounds yummy. Printed it off for the weekend! Would it be wrong if I made these for breakfast? They look gorgeous! 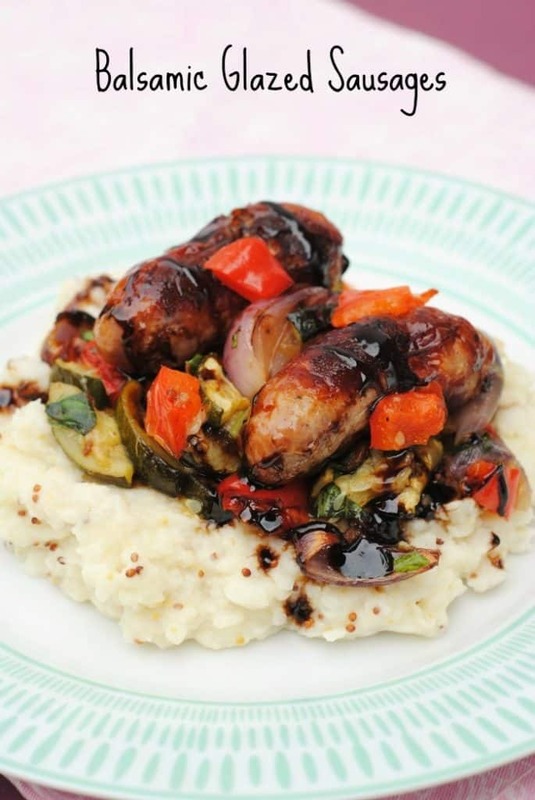 Oohh we do something like this as a cold nibble at christenings – honey and balsamic sausages! How yumm! This sounds delicious! I’m pinning it to try myself next week 🙂 I love balsamic vinigar too, especially as a glaze.